Venezuelan electoral officials say voters have narrowly elected Hugo Chavez's hand-picked successor as president in a razor-close special election Sunday. 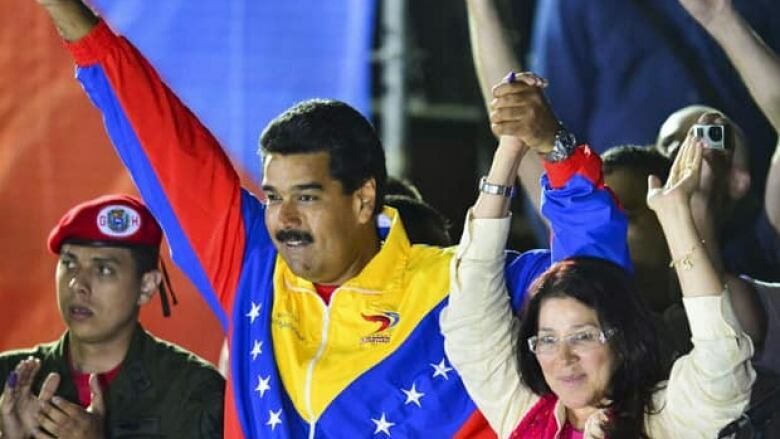 Hugo Chavez's hand-picked successor, Nicolas Maduro, won a razor-thin victory in Sunday's special presidential election, edging the opposition's leader by only about 300,000 votes, electoral officials announced. His challenger, Henrique Capriles, declared that he wouldn't accept the results and called for a full recount. Maduro's stunningly close victory came after a campaign in which the winner promised to carry on Chavez's self-proclaimed socialist revolution while Capriles's main message was that Chavez's 14-year regime put Venezuela on the road to ruin. Despite the ill feelings, both men sent their supporters home and urged them to refrain from violence. Maduro, acting president since Chavez's death, held a double-digit advantage in opinion polls just two weeks ago, but electoral officials said he got just 50.7 per cent of the votes to 49.1 per cent for Capriles with nearly all ballots counted. The margin was about 234,935 votes. Turnout was 78 per cent, down from just over 80 percent in the October election that Chavez won by a nearly 11-point margin. Chavistas set off fireworks and blasted car horns as they cruised downtown Caracas in jubilation. In a victory speech, Maduro told a crowd outside the presidential palace that his victory was further proof that Chavez "continues to be invincible, that he continues to win battles." But in a hint of discontent, National Assembly President Diosdado Cabello, who many consider Maduro's main rival, expressed dismay in a tweet: "The results oblige us to make a profound self-criticism. It's contradictory that the poor sectors of the population vote for their longtime exploiters." At Capriles' campaign headquarters, people hung their heads quietly as the results were announced by an electoral council stacked with government loyalists. Many started crying; others just stared at TV screens in disbelief. But Capriles emerged later to angrily reject the official vote totals. "It is the government that has been defeated," he said. Capriles said at his campaign's headquarters that his campaign's tally of votes came up with "a result that is different from the results announced today." "The biggest loser today is you," he said, directly addressing Maduro through the camera. "The people don't love you." Maduro, a longtime foreign minister to Chavez, rode a wave of sympathy for the charismatic leader to victory, pinning his hopes on the immense loyalty for his boss among millions of poor beneficiaries of government largesse and the powerful state apparatus that Chavez skillfully consolidated. 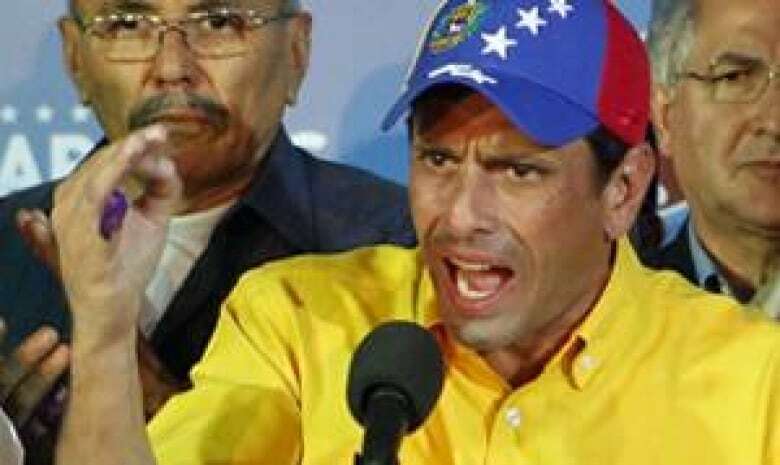 Capriles' main campaign weapon was to simply emphasize "the incompetence of the state" in handling the world's largest oil reserves. Millions of Venezuelans were lifted out of poverty under Chavez, but many also believe his government not only squandered, but plundered, much of the $1 trillion in oil revenues during his tenure. Venezuelans are afflicted by chronic power outages, crumbling infrastructure, unfinished public works projects, double-digit inflation, food and medicine shortages, and rampant crime — one of the world's highest homicide and kidnapping rates — that the opposition said worsened after Chavez succumbed March 5 to cancer. That discontent was thick across the nation. "We can't continue to believe in messiahs," said Jose Romero, a 48-year-old industrial engineer who voted for Capriles in the central city of Valencia. "This country has learned a lot and today we know that one person can't fix everything."